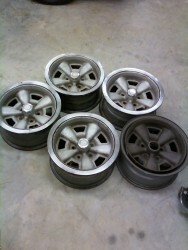 Description: These are 5 wheels that are correct for a 1970-1973 Z and 1971-1972 SS Chevelle. These have the oval valve stem hole compared to the late model wheels that have the circular valve stem hole. They need to be restored but are not rusted and the bolt holes are nice. Comes with 1 NOS center cap in the box.